We have already covered what I consider are the Best Games of 2015 (that I've managed to play of course) but gaming isn't, and shouldn't be, dominated by just the new hotness. That's why every year I look back at which games have actually hit my table the most. As with every year I have to give kudos to Fire Broadside, who I shamelessly stole this idea from and I love reading his lists every year. 2015 was the year I returned to role playing games. RPGs used to be the corner stone of my gaming, but over the years it has waned and board games have taken over. But this last year my friends expressed an interest in playing a table top roleplaying game and instinctively approached me to run a game (I'm not sure what that says about their opinion of me). After a bit of research and fielding the question to all the @PolyhedronC followers on Twitter, the consensus was that the latest version of Dungeons & Dragons was an excellent place to re-enter the hobby. So off I went and purchased the D&D Starter Set and we all got involved in some dungeon delving. Unfortunately due to time commitments our sessions fell apart but that's not a slur on the Dungeons and Dragons 5th edition system. It manages to capture what made D&D the role playing classic it is but also managed to simplify and streamline in clever ways. It may have less tables, dice and stats compared by previous versions but is maintains all the character and flavour. For some reason my playing of miniatures games has been rather thin on the ground this year. I haven't played a single game of Warmachine or Hordes, games that made it to the top of my list last year, and I don't know why. It could be because I'm getting painter fatigue, or it could also be that my experiences at a local tournament back in early 2014 put me off the game a bit. The game just stopped being fun after being subjected to cheesy army lists and overly aggressive players was a bit of a turn off. I haven't played as much Star Wars Armada as I would have liked, but due to the longer play time, Armada has crept up this list. Armada manages to take the beauty and simplicity of X-wing but make it into a slower and more strategic game so far I really like what I see with Armada, but at the same time I haven’t bought much in the way of extra ships. Hopefully my local tournament scene for Armada will pick up, as I’m rather looking forward to the excuse to play this a bit more. Forget about the new hotness, you have go back to 2012 to find my most my most played miniatures game of the year; Star Wars X-Wing Miniatures Game. Part of the reason for this was tournaments, I took part in around 6 different X-Wing tournaments in 2015, and even though there is the odd hard-core player, the majority of games where fun and light hearted. This is exactly what X-Wing should be about. X-Wing shows no signs of stopping, with the recent Force Awakens ships, and the new ships from Star Wars Rebels, increasing the roster and choice of ships. Unfortunately, The Force Awakens didn't introduce many new ships, so let's hope Rogue One in 2016 can further expand our fleets. When I say card games I mean collectible / expandable card games and this year my gaming was dominated by one game. Warhammer 40,000 Conquest featured heavily in my card gaming during the early half of the year. I entered a couple of tournaments and as is normal for me at tournaments, I came last. It was an interesting experience and forces you to look very critically at how you play and what you enjoy about the game. I have played more tournaments than ever before this year, and as we’ll see later in this article, it’s made some stark impressions on the year’s gaming. Unfortunately I can't see me carrying on with Conquest next year. The game itself is still a great card game but I personally think its days are numbered. There are very few tournaments near me and keeping up with the card buying quickly becomes expensive. The other issue I have is that as the player base starts to dwindle, it means that player base becomes much more hard-core, meaning tournaments start getting harder and harder to enjoy. I hope that Fantasy Flight Games give Conquest a bit more of a push, the game deserves to be a lot more popular than it is, with a great implementation of the Warhammer 40k licence. 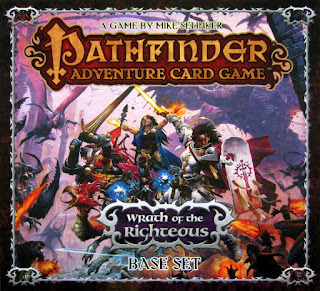 I'm never really sure where the Pathfinder Adventure Card Game sits in my own categories; it's more a board game than card game by my own definition but doesn't include a broad and is rather customisable, within its own parameters. This year I have mostly been playing the Wrath of the Righteous boxed set, the third set in the series. The reason Pathfinder ends up on the list is because it's an addiction. Due to the game’s campaign elements, such as character progression and an overarching story, it's easy to get drawn in and want to see how your character will grow. However, the card game I played the most, and actually my most played game of 2015, was Doomtown Reloaded. It's amazing what a tournament can do to your play count, and taking part in what turned out to be the biggest Doomtown tournament outside of Gen Con, and certainly the biggest in the UK, means you have to put a bit of practise in. It’s a testament to Doomtown that my practise sessions were a joy to play; it's such a deep game and requires a lot of knowledge and practise to be truly great at the game. It's the careful building of your deck, balancing not only the rules on the card but the face value for your shootout draws. The most important aspect of the game is the careful placement and application of your dudes and abilities and not about how powerful your deck is, and this is the part that really requires plenty of plays to get the hang of. I'm starting to notice a regular staple of games in my annual board game playing. These games may not be my most played games of the year but have a steady appearance in my recorded plays. To me these games are the classics, the games that make up the core of my board game collection. Games such as Pandemic, Dominion, Ticket to Ride and Lords of Waterdeep appear regular as clockwork, and the year I add another game to the list: Dead of Winter. 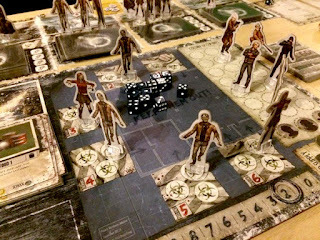 For many in the board game community Dead of Winter is a bit of a marmite game, but personally I love it. It's the closest experience to being part of a Stephen King novel with moving to New England. A group of zombie holocaust survivors scratch out a meagre existence in a snow bound small town America while being beset at all times by the living dead. Apparently there is a traitor mechanic in the game, but due to the luck of the draw, I have never played a game of Dead of Winter with a betrayer. Bizarrely I don't actually own this game and yet it is the most requested game and my regular board game nights. 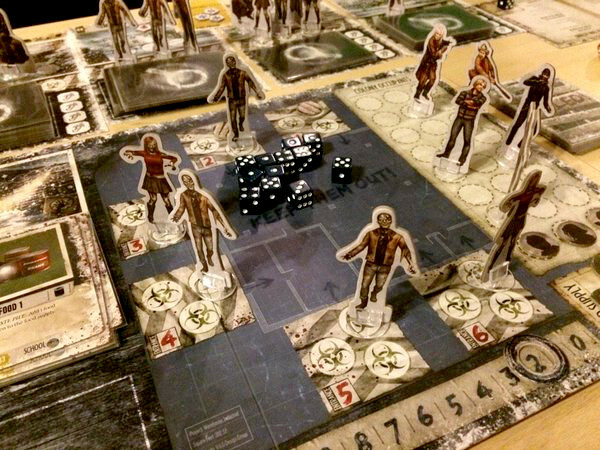 For me 2015 was the year of the integrated board game app, as two of the games I played the most during the year where Alchemists and XCOM the Board Game. Both games require some form of electronic device to play, typically a smart phone or tablet, but both games use the technology in completely different ways. XCOM uses the app to fully run the game, controlling the time allowed for each stage, handling the randomisation of alien invaders and altering these factors based on how well, or more likely how baldy, you're doing. In XCOM the app is integral the game to the point where you simply cannot play the game without it. Alchemists on the other hand takes a completely different approach, and uses your smartphone to control hidden information. As the name might suggest, Alchemists is all about brewing magical potions, but more importantly deducing the magical properties of the various ingredients. When you want to brew a potion, or test some ingredients on your poor assistant, you will take a photo of the two ingredients and the app tells you the result. By testing different ingredient combinations you can hopefully gain enough information to deduce the properties of each ingredient and publish a paper on your findings. Alchemists is a fantastic blend of deduction, technology and, to be fair, rather complicated worker placement all wrapped up in a comic art style that bears more than a passing resemblance to the Unseen University. Considering I only purchased the game in October, Codenames has raced to the top of my most played game of 2015. I don't know whether it's because of the simple rules, the quick playtime, the fact that it makes a great 'end of the game night' round up or whether the game is just bloody brilliant but CGE's spy themed word association game hits the table every week. My most played board game of 2015, by a long shot, was Star Wars Imperial Assault, and as with many games that get multiple plays this was due to the campaign nature. You could call Imperial Assault Descent 3, because the game is a natural evolution of the descent mechanics but with a Star Wars theme and it's amazing how well this theme applies to a dungeon crawler. Whether it's breaking into an imperial base to steal security codes or escaping from a bounty hunter, the blend of tactical miniatures and racing to complete your objective in the nick of time.